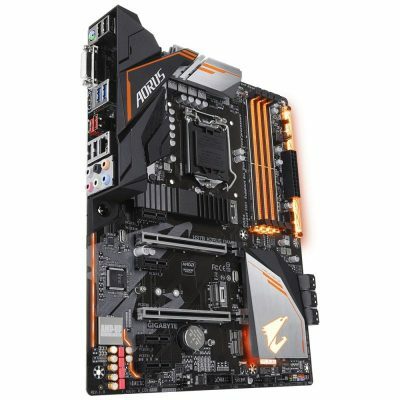 Z390 AORUS PRO motherboard uses an 12+1 phases digital CPU power design which includes both digital PWM Controller and DrMOS. These 100% digital controller and additional 8+4 Solid-pin CPU Power Connectors offer incredible precision in delivering power to the motherboard’s most power-hungry and energy-sensitive components, allowing enthusiasts to get the absolute maximum performance from the new 8-core 9th Gen Intel® Core™ processors. The Z390 AORUS Platform supports Intel’s latest Optane technology. Optane fuels storage performance by acting as a cache drive giving users a significant boost compared to traditional mechanical drives. – All Hybrid Fan Headers can automatically detect the type of cooling device whether it be fan or pump with different PWM or Voltage mode. AORUS’ exclusive one piece stainless steel shielding design prevents against PCB distortion/twisting and plate bending, in addition to preventing any possible ESD interference. GIGABYTE’s EasyTune™ is a simple and easy-to-use interface that allows users to fine-tune their system settings or adjust system and memory clocks and voltages in a Windows environment. With Smart Quick Boost, one click is all it takes to automatically overclock your system, giving an added performance boost when you need it the most.